Let me introduce myself. My name is David Niven Miller. I live and work in Perth, West Australia. I'm 66 years young. My life goal is to help 30 million people get healthy - the kind of health where you enjoy effortless weight loss, a happy outlook on life, and tireless energy. I just love healthy living, explaining my natural lifestyle and keeping up with the latest health news. I started this blog in 2003 to empower people to take full responsibility for their own health and happiness by investigating, discussing, and critically rethinking all our beliefs about wellness. For the first four decades of my life I was a pretty conventional sort of guy (health-wise). I was born in Africa, in what was then Rhodesia, is now Zimbabwe. My father was an engineer, building the mighty Kariba hydro-electric dam, at the time the world's biggest. We lived miles from nowhere, in the hills above the hot Zambesi river valley. My mother tried to grow a few vegetables and some paw paw (papaya) trees, but the baboons stole nearly everything. Most groceries were trucked in from the capital, 250 miles away. We had access to fresh fish from the lake and game (a variety of antelopes, warthog / bush pig) as well as beef, which at the time was the best in the world. Almost every meal we had some kind of meat. My favourite food was a large bowl of cornflakes, fresh creamy milk (which was raw, not pasteurised in those days), dollops of cream and chopped avocado or banana. I was a strong healthy lad with plenty of energy. I moved to Australia nearly 40 years ago, and now live in Perth, on the west coast. It is the lucky country, and I am grateful to be here. We have a national health system with subsidised doctors and pharmaceuticals, and free care if you need to go to a public hospital. The standard of medical care is in line with other Western countries. Over the years I assumed that doctors, dentists, medical associations and the government regulators were the best source of health information and support. Who could give better advice on how to stay young and healthy? Who else would give accurate, unbiased advice on diet, medicine, the best remedies and the optimal lifestyle? By the time I reached my late-forties, I had to capitulate that their advice was not working. I looked and felt at least ten years older than my real age. My body did not have the real health and energy that I knew was possible. Several ailments had bugged me for years and they were getting worse, not better. I felt stressed and dissatisfied. My digestion was poor, I was balding, my skin was terrible, and there were a few niggling aches and pains that were gradually increasing. Different doctors had little to say that helped. All they had to offer was ... drugs. It was clear that if I wanted genuinely good health - with sufficient time to discover the root causes of my ailments, unbiased practical advice, and remedies that really work - then I had to put a lot of time and effort into investigating everything myself. So began my journey studying different remedies, diets and lifestyles. I have spent the last twenty years researching what really works in health and longevity. I found many people who looked more than a decade younger than they actually were. As I got to know them, I realised they weren't even trying to stay young and healthy! They were playful and had fun. They exercised, but less than me. They ate foods that were delicious and enjoyable. I was shocked to discover that many of the foods they regularly used were the same ones I had avoided for so many years. I went to India and lived in an ashram for a couple of months. I volunteered to work as one of the lunchtime chefs, and prepared hundreds of meals every morning. This was the first time I had worked at such a scale - hot, sweaty, hard work. It confirmed my love of food, especially food produced with love and integrity. It was also an opportunity to meditate for hours each day, and meet with people who were playful, happy and healthy. I travelled to and studied areas of the world where people are traditionally long-lived, and also places where the health of the population is deteriorating rapidly. 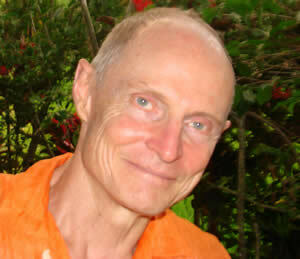 I tried many different diets and health approaches over the years, including vegetarian, vegan, ayurvedic, Taoist, raw food, macrobiotic, acid-alkaline, blood-type, paleolithic, Mediterranean, traditional, and the diets in numerous popular books. I interviewed hundreds of people to get their personal experience and assess how they are aging. I learned everything I could about human evolution, nutrition, healing with food, psychology, mind-body links, consciousness research and different types of meditation. I researched (and used myself) yoga, pilates, breath work, Taoist exercises, various modes of bodywork, and heat and cold treatments. A lot of the health information we read is simply not true. It is carefully crafted to serve the industries that sponsor these articles. I was dismayed to discover that so much of the information on the web, in popular books, and even in published scientific research is just lies and twisting of the facts. The big corporates - pharmaceuticals, medicine, agriculture, food, health products, supplements, weight loss, personal care and health and medical regulatory bodies work for their own financial interests rather than your health and wellbeing. I am outraged by the mass-marketing of deadly drugs, unnecessary surgery and medical procedures, harmful foods and enslaved lifestyles that ruin most people's lives. That's what they get - because they don't ask for anything better. If we simply pay attention, take care, take responsibility, and demand natural, nutritious foods and effective natural cures using the dollars we spend, then we'll get it. The only answer is taking personal responsibility for everything that has ever happened or will ever happen to you - this applies to health and to every other aspect of your life. I am convinced that this is the most proactive, effective and only way to live. Now, more than ever, you simply cannot hand over your life to others to look after. Look at the evidence: 40 million Americans with early or full-blown diabetes, one in three morbidly obese, and on and on. I want to change this. I was delighted and excited to discover that many traditional home remedies, natural ingredients and old-fashioned, unprocessed foods are highly effective natural cures - much more effective than drugs and medications. Several complaints I had had for years were healed within weeks of starting one of the healthy folk remedies detailed on this website. Most of these natural remedies are cheap, natural, widely available, and cannot be patented. Many have been deliberately discredited and even outlawed. My calling is discovering home remedies, natural cures and ways of living that really work. I am an independent researcher, scout, critic, inquisitive thinker and truthful communicator. I help people take responsibility for their health, fitness, happiness and welfare in the face of a tsunami of flawed conventional wisdom that can lead even the best-intentioned astray. I inspire people to be open-minded about how to lead a healthy, happy, fit, energetic, balanced, functional life with the least possible amount of pain, suffering and sacrifice. In fact, the life structured in Grow Youthful is one of (a new kind of) indulgence. Millions of people are discovering how to cure themselves of ailments they have had for years, usually at little or no cost. I get a buzz from helping such large numbers of people. I also thoroughly enjoy being able to justify spending so much time researching and experimenting with my own health! My biological age is now years younger than that of the man who started this quest. I am now living a healthy, joyful, energetic, productive and youthful life. On this website and in the Grow Youthful eBook I share my discoveries with you, and I am confident that this information can literally transform your health and your life. My life goal is to help 30 million people get healthy - the kind of health where you enjoy effortless weight loss, a happy outlook on life, and tireless energy. I am self-employed, and not under any kind of pressure from sponsors, clients, employers, and especially food or pharmaceutical industries or any kind of health or medical association. I am unbiased, open-minded, and not beholden to any particular approach to health. A gift I have is being able to sift through the mass of conflicting and misleading messages, jargon and confusion out there. I've spent many years researching the root causes of aging and ill health. I've read every book and article I could find on health and longevity - popular books, scientific research, holistic and natural health, ancient texts and traditional wisdom. I find what really works, clearly and simply. What I say is just common sense. Everything I write about I have actually tried myself, or gained through personal contact with people who have used these remedies themselves. I write from personal experience with scientists, sick people, naturopaths, doctors, herbalists, people who look 15 years younger than their age, people who are aging fast, and people who are as passionate about health as I am. David has had careers as a government and private industry economist, a commissioned army intellignece officer, a computer systems manager with the Shell Oil Company, the creator of a successful software business, a best-selling author of computer books and a public speaker.